Our Lamb Bratwurst is a sausage for all the lamb lovers out there! 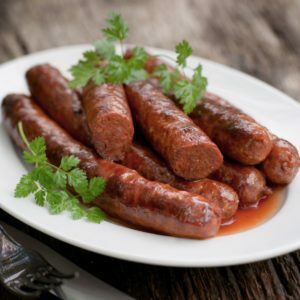 These sausage links are quickly prepared and add an extraordinary flavor to your dish. The Lamb Bratwurst one of our most elementary products. Filled with thyme and a hint of paprika, the lamb flavor is outstanding. Just what you are looking for when you want lamb. And yes, it has that very “gamy” flavor – that is exactly what we like and thus perfected in this creation. The fresh thyme perfectly brings out the meat flavor. 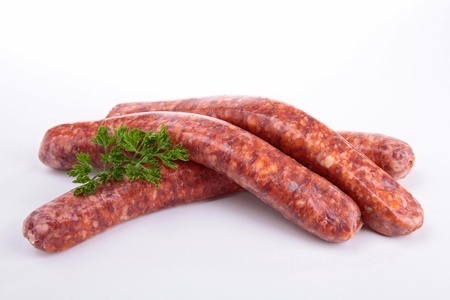 As a result the balanced seasoning make this a sausage you’ll not find anywhere else. . The Lamb Bratwurst is our creation. It is a lean, healthy option for someone that does not like pork. Therefore making this a good alternative to the regular sausage assortment. We love having the Lamb Bratwurst with some roasted potatoes and a creamy mushroom sauce. Ingredients: Lamb, oil, water, salt, spices, fresh thyme, fresh onion, fresh garlic. Stuffed in a natural sheep casing.